This February, hatred has a new face. 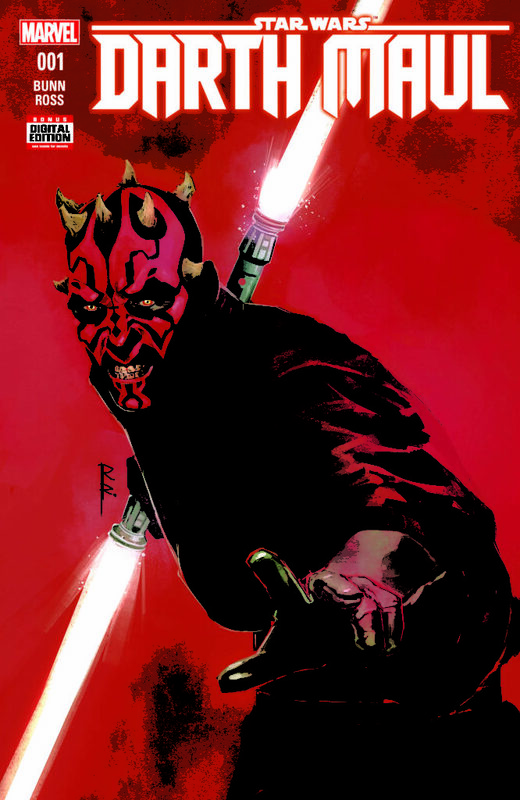 Marvel Entertainment & Lucasfilm Ltd. are pleased to announce STAR WARS: DARTH MAUL #1 – the next thrilling Star Wars limited series comes to comic shops and digital devices everywhere! Blockbuster writer Cullen Bunn (Deadpool Kills the Marvel Universe, Monsters Unleashed) and artist Luke Ross (Star Wars: The Force Awakens Adaptation) take you inside the mind of Darth Sidious’ star pupil as he embarks on a personal quest – with deadly consequences! Bred on hate, fear, and anger. Steeped in the ways of darkness…trained to kill. Darth Maul’s time as an apprentice to Darth Sidious has long been cloaked in shadows, but at last we will reveal his tale of revenge. His master tells him to embrace his anger, but to stay hidden and bide his time. Maul has waited long enough – his patience growing ever thinner. His moment to step into the light has finally come. Prepare for a tale of unbridled rage as Darth Maul readies one of his first encounters with his mortal enemy…with the Jedi. The fan-favorite character takes center stage this February as Bunn and Ross take you inside the mind of the Sith in the can’t-miss STAR WARS: DARTH MAUL #1!